These holders feature brightly colored edges and are constructed from a super heavyweight vinyl material. Having three eyelets at the top of the pocket makes it possible to hang the holder in a variety of ways. Colored shop ticket holders let you color code important paperwork and make special jobs stand out. Works great for organizing work by department, day-of-the-week or importance. Heavy duty vinyl construction allows for easy visibility of documents and stitched seams ensure long-lasting utility. Reinforced header and stitched edges for longer product life. 9 x 12 holder has colored stitched edges. Assortment includes 5 each black, red, green and blue. 20/BX. Learn about the wide variety of shop ticket holders at C-Line..
Shop Ticket Holder Special Features: Features 3 eyelets for hanging. Hi. I'm John at C-Line and today we're going to talk about our Super Heavyweight Plus Shop Ticket Holders. These heavy duty vinyl holders feature a reinforced header and stitched edges to provide maximum protection for your documents. The vinyl is 30% thicker than our traditional Super Heavyweight Shop Ticket Holders, providing added strength and durability. Clear on both sides, the holders store up to 9 x 12 inserts and are open on the short side. Each holder has 3 metal eyelets, giving you multiple hanging options so you can post information wherever you need it. 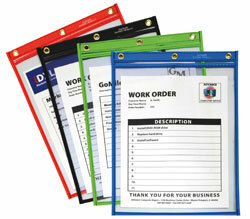 These colorful holders let you color code important paperwork and make special jobs stand out. You can organize by department, day of week or importance. Super Heavyweight Plus Shop Ticket Holders are perfect for manufacturing, auto repair, inventory control, retail, office and shop environments. Anywhere information has to be posted and readily available. Order yours now! That's all we have for today. I'm John with C-Line. Thanks for watching.